GN Solid Controls has devoted many years to the R&D and production of mud solids control equipment and waste mud processing equipment. At present, the product line covers more than 40 types, covering the fields of oil and gas drilling, construction mud purification, oil sludge treatment, and river clearing. In the field of silt treatment, the solid-liquid waste environmental protection field, and the six major types of professional equipment in the field of medium transportation are processed and manufactured. The following describes a widely used conveying conveyor,screw conveyor mechanical equipment, screw conveyor application is very extensive, mainly the use of rotating spiral blades will be pushed into the material to be transported to the other end of the shell discharge. Spiral conveyors are widely used in food, pharmaceutical, chemical, papermaking, environmental protection, metallurgy, building materials, petroleum, electric power and other industries. There are many types of screw conveyors to meet the requirements of different working conditions and different materials. The difference between GN solid-contained screw conveyors and ordinary conveyor manufacturers is that GN solid control’s production, processing and manufacturing standards meet the requirements of high-risk operation sites such as petroleum, mining, marine, and chemical engineering. The screw conveyors produced meet the requirements of the American Petroleum Institute. API manufacturing standards, meet EU export CE certification standards, and meet Australian national security and environmental standards. 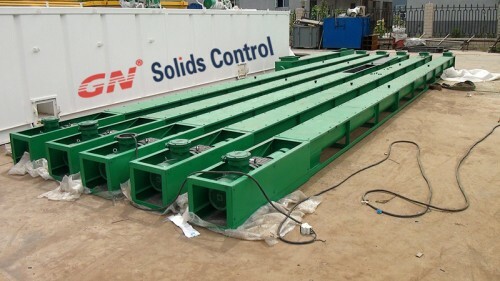 GN solid-controlled screw conveyors are characterized by high wear resistance, strong acid and alkali resistance, oil resistance, and easy maintenance. 1, simple structure, cross-sectional size, small size, easy to arrange. 2, easy to load or unload at different locations, that is, you can set a number of feeding port or discharge port. 3, operation safety, easy maintenance. 4, have a good seal, keep the environment clean. 5, the delivery of easily broken materials, the higher the broken rate. 6, when the material is conveyed to overcome the friction of the material, so the spiral blade wear. 7, with high wear resistance, strong acid and alkali resistance, oil resistance and other characteristics, can adapt to high-risk, rough workplace.